What does it take to capture the attention of today's crazy-busy, well educated prospects? They certainly don't want to take time learning about your products/services. 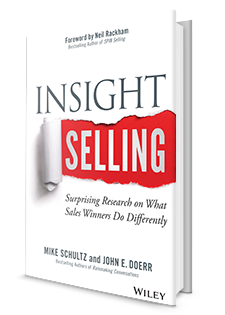 That's why I thought you'd be interested in my recent interview with Mike Schultz, author of the new book, Insight Selling: Surprising Research on What Sales Winners Do Differently. I hope you enjoy it. JILL: So what exactly is "Insight Selling? Insight Selling is the process of creating and winning sales opportunities, and driving change, with ideas that matter. You can use ideas to create sales conversations and fill the pipeline. Ideas make a huge difference in winning sales and beating competitors. Sellers who leverage ideas drive change—they’re not just middlemen. And when the ideas matter to the buyers, the seller increases value. JILL: Can you give us a brief overview of the research behind your book? Mike Schultz: Since “The End of Solution Sales” was published in 2012 by the Harvard Business Review, there’s been a lot of disagreement in the sales world about what’s working and what’s not. We decided to study what was actually happening. We wanted to know the answer to this question: “What are the winners of actual sales opportunities doing differently than sellers who come in second place?” To find the answer, we studied over 700 B2B purchases made by buyers responsible for $3.1 billion. We found that winners sell radically differently than second-place finishers, and that winners exhibit a specific combination of behaviors to achieve better outcomes that second-place finishers don’t. And, in case you were wondering, solution sales is not dead. Sorry HBR, I disagree. It needs to evolve, and it’s just a piece of the whole now, but it’s not dead. JILL: You talk about "winning with insight." I love that phrase. How did winners leverage it in the sales process? 1. Winners introduce buyers to ideas they need to know about. We call this opportunity insight. This is when the seller knows a buyer should be doing something and the buyer has little or no idea about it until the seller brings it up. 2. They ask disruptive questions, pushing buyers out of their comfort zones, encouraging them to think differently. We call this interaction insight. In this sense, buyers often come to new insights on their own with the seller guiding them. The seller doesn’t just bring ideas (opportunity insight), they also spark ideas through how they lead their conversations. JILL: One of the things you highlight is that winners are better at connecting the dots. Can you explain what you mean? Mike Schultz: This is the whole “solution sales is not dead” thing. In our research, sellers who won did a much better job understanding buyer needs and crafting compelling solutions. I don’t care which solution or consultative sales method you subscribe to, this is the essence of the concept of selling a solution…an outcome. We found that when sellers didn’t connect the dots, they lost! Connecting the dots, however, didn’t get them the win. It is necessary, but not sufficient. Sellers need to do more to find themselves in the winners circle. JILL: In my experience, the majority of sellers lose to “no decision” more than all their competitors combined. How are winners getting people to change from the status quo. Mike Schultz: Imagine for a minute a buyer wants to do something they should do, but don’t have to do. In this case, a buyer must justify a new course of action, and justify their investment in this action. Why we need this. Winners are much better at both connecting the dots and communicating the ROI case. Why we should buy it from them. Winners are much more likely to convince buyers they are the best choice. Why it will work. Winners do a better job building buyer belief and mitigating risk. When the buyers themselves can make this case to their board…their colleagues…themselves…whoever, they take action. Winners help buyers make this case, and thus lose fewer sales to no decision. JILL: Mike, in your book you state: "Sales winners make strong personal relationships at more than double the rate of second place finishers." How are they doing that? Mike Schultz: This is interesting because another Harvard Business Review article came out recently titled “Selling is Not About Relationships.” Again, I disagree. I’d say it’s not all about relationships, but relationships are certainly critical for selling success. Don’t fear the personal relationship. Get to know people. Let them get to know you. Don’t confuse being “liked” with seeking harmony. You can be liked and still be an assertive and forceful agent of change for a buyer. Find ways to spend time with buyers. Relationships deepen when you spend time with people. JILL: I love your focus on collaboration. Not a lot of people are talking about that subject, yet I think it’s crucial. How are winners collaborating differently from others? Mike Schultz: The sellers that won were almost three times as likely to be perceived by buyers as collaborative. When we talked to buyers and asked them what collaboration meant to them, by and large what we heard boiled down to this: they believed sellers worked with them to achieve mutual goals. When sellers practice interaction insight (described earlier), the buyers really feel the collaboration. We also included “educated me with new ideas and perspectives,” the number one factor separating winners from second-place finishers, under the heading of collaboration. When ideas are worthwhile, they can inspire buyers to pursue new opportunities. That’s opportunity insight. This is why we titled the book Insight Selling. The number one and number two factors separating winners from second-place finishers were “educated me with new ideas and perspectives” and “collaborated with me” in the sense of working together to achieve mutual goals. Indeed, harnessing the power of ideas is what winners do differently than second-place finishers. JILL: Thanks so much, Mike. Great stuff. Click here to get your copy of Insight Selling. If you order by May 10th you'll get access to exclusive high value sales resources (including an interview with me about What it Takes to Succeed in Sales Today). The research behind it is rock-solid. And, the insights you gain from reading it will transform how you sell. 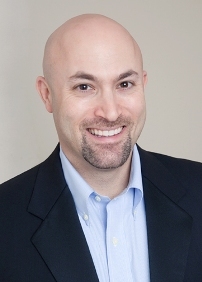 Mike Schultz is President of RAIN Group, an industry-leading sales training and consulting company. He's also the bestselling author of Rainmaking Conversations: Influence, Persuade and Sell in Any Situation, Insight Selling: Surprising Research on What Sales Winners Do Differently, and writes for the RAIN Selling Blog. Follow Mike on Twitter at @mike_schultz.